[Long Beach, CA] – Jim is the founder of Ballpark Broadcasting, which began as “Ballpark Radio” in 2003, as a companion to his longstanding men’s fastpitch website, Fastpitchwest.com. Its purpose was to provide an easy-to-find place for fans to enjoy live and archived broadcasts of men’s fastball games, its goal to provide a higher profile for what Jim calls “the greatest sport on the planet.” Jim learned the ropes of streaming audio from streaming pioneer, the late David Blackburn, back in 2001 when David was doing test broadcasts in preparation for the World Tournament audio broadcast program. Following his first solo broadcasts of men’s fastball in 2003 at a National tournament in Chippewa Falls, Wisconsin, Jim joined up with his friends Blair Setford and Joe Todd to broadcast the Tournament of Champions in the U.S. and Canada from 2004 through 2008, broadcasting over 150 games during the five year stint. Current Ballpark Broadcasting anchors, Kyle Smith and Lance Winn, joined that crew in 2006. From 2009 through 2011, Jim assumed duties as the program director for the World Tournament streaming video broadcast program. In 2010, Jim produced the first ever Spanish language men’s fastball broadcasts in partnership with his friends in Argentina at Softbol Radio. Jim has broadcast hundreds of games in the United States and Canada, including the ISF Jr. Men’s World Championship in Whitehorse Yukon Canada on radio in 2008 and live streaming video in 2014 in partnership with SportsCanada TV. The latter was Jim’s largest – and most enjoyable broadcast experience ever, 54 broadcasts in 10 days. 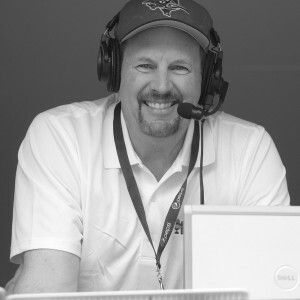 Broadcasting over 50 games at the 2015 WBSC World Championships in Saskatoon promises to be the pinnacle of more than a decade of broadcasting men’s fastball. He is delighted to have the “band back together again”, with all four of the Whitehorse crew members returning for the WBSC, along with longtime broadcast colleague Blair Setford, who was unable to make it last summer. Jim has played fastpitch for over fifty years, starting at the age of nine, having pitched in more than two dozen national and world tournaments. Ageless ballplayers like Satchel Paige and Minnie Minoso are among his favorites. In everyday life, Jim is a lawyer at the Flanagan Law Firm in Long Beach, California. He comes from a large Irish family of seven children.